First we gonna make stuffing for peppers. Boil and mash the potatoes well. Add salt, chillipowder, amchoor powder and lime juice to it. Mix them well. Chat Masala can also be used. Now stuffing is ready. Cut the pepper in vertical slits and clear out the seeds. Stuff the potato mixture inside pepper. Take a bowl, add ajwin,cumin,gramflour,chillpowder,salt and baking soda. Add little water and make thick batter. Make sure that lumps are not formed. Now dilute the batter for the required consistency. Batter should not be thick or thin. Now dip the stuffed peppers in batter,and drop it in medium heated oil. Deepfry the peppers on bothside. Now Mirchi baaji is ready. 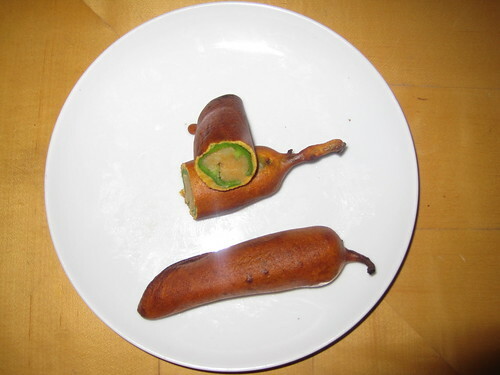 Mirchi Bhaji can be served with steaming tea and with any kind of chutney. This South Indian Recipe can be served as Evening snacks. I am sending this recipe to Rahika's Deep Fried Snacks Event. To answer you question, I don't know where u live, but many stores even in India now carry chinese and thai seasonings, including Fab India - Hope that helps! Very tempting n yummy..love it anytime! 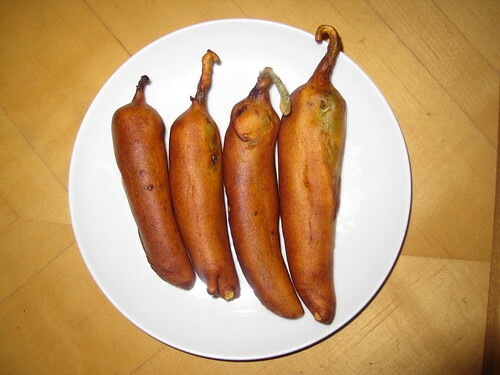 Milagai bhajji is default when I goto beaches in chennai... stuffed milagai bajji.. I am hearing this just for the second time after Denny's.. great recipe..